We survived! I wasn’t sure we could do it, but we survived an entire month without eating out. While I did not give up my regular jaunts to Caribou Coffee, and I did partake in some movie theater snacks, I did not eat out or do delivery or take out at a restaurant once in the 30 days of the challenge. I also did not grab anything from a grocery store deli. My 3 sons did go out to eat twice with their grandparents. I really didn’t make a big deal out of this, because I do not want to deny my children the opportunity to spend time with their grandparents. I’d give anything to have another meal with my own grandparents. My parents also invited us to dinner at their house three times, for which I am extremely grateful. Temptation is everywhere. I never realized how much temptation there was until I told myself I couldn’t go out to eat! Radio and television ads, billboards, the smell of food cooking outside of a restaurant, seemed to constantly taunt me. Much of my socialization with my family and friends surrounds food, and much of that is done at restaurants. We had to break out of our normal routines for the challenge. We had to learn to schedule our errands and family activities to avoid meal times. Planning is critical to avoiding eating out. Getting into the habit of planning a menu was one of my main motivators for doing the No Eating Out Challenge. I knew that I would have to do some careful meal planning if I was going to stick to the challenge, and I knew the only way I would do the planning is if I took away the ability to eat out. I had come to rely quite heavily on take out and restaurant dining whenever I didn’t know what to have for dinner. It’s a lazy approach that just ravages your budget and your health. I now know that having a plan makes for better finances and diet. I made sure to thaw foods out and to plan my grocery list accordingly. Not only was dinner easier, shopping was a breeze! Have a back-up plan. I’ve learned to have a few go-to, last minute convenience foods on hand for those days when you are sick, uninspired, or just plain too rushed to pull together a regular dinner. Breakfast for dinner, mac & cheese, and frozen pizza all fit the bill for these occasions. I wouldn’t want to make them a regular part of the menu plan, but it’s good to have them on hand just in case life gets in the way of your usual dinner plans. Have fun eating at home. We had a few meals with family and we made a few things that aren’t normally on our menu. I learned how to make lunches from home more tolerable and how to treat myself to some tasty appetizers. I also baked a few more desserts than usual. After a couple of weeks, I started to enjoy hunting up new recipes and scouring the freezer and pantry for ingredients. My health improved slightly. I’ve lost 3 pounds this month. I probably would have lost more had I not been doing all the baking. More importantly, I feel better. I’m not so bloated from all the soda and salt that often comes with restaurant meals. Our finances were better. I don’t have an exact figure, but just looking at the calendar and placing an estimate on all the times we would’ve liked to eat out but didn’t, I would guess we saved about $250. Because we were eating at home, our grocery bill did increase slightly, but we still noticed a definite improvement in our bottom line. Eating out becomes a crutch that we use when we’re busy, but in actuality, with a little planning, it doesn’t take any longer to make a meal than it does to bring home take out. I’m more mindful of the dining out experience. This challenge helped me realize that most of the times we ate out, it was mindless. We didn’t even really enjoy it all that much. I will now focus on fewer, more enjoyable restaurant experiences. I also learned a new appreciation for those who never get to eat out due to things like unemployment or food allergies. You shared your stories, ideas and inspiration during the challenge, and I’m grateful to you for your help. I will never again take eating out for granted. For me, the No Eating Out Challenge was all about establishing a habit. I knew that our habit of eating out all the time was becoming hazardous to our health and our wallets. I knew that we had to go cold turkey at first if we were going to succeed. I’m proud of how we did with this challenge. I’m proud that I’ve grown more comfortable in my kitchen. I’m better at planning a menu and rolling with the unexpected without dialing for take-out. I think some of my family thinks I’m going to go on a restaurant bender now that the challenge is complete, but to tell you the truth, I’m not in a hurry to rush out to a restaurant. My birthday is later this week, and I’m looking forward to going out for nice dinner, but after that, we’ll see. I have a plan now – a plan to stick to a healthier way of living. 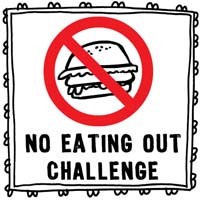 How did you do with the No Eating Out Challenge? What things did you learn? We did not go the whole month without eating out but did not really intend to this first time out. We did, however, reduce the number of times we went out and saved a significant amount of money. I also noticed that this had the unintended but happy consequence that we spent less in almost all our discretionary budget categories (clothes, books, other shopping). Apparently, planning errands and shopping around eating at home cut into those activities a bit. LOL We have had some pressures. For instance, we have a family member that we have lunch with at McDonalds practically every weekend (sometimes 2X a weekend) and he is really put out that we’re not doing that. We’ve invited him over for home cooked burgers and fries and he hasn’t come once. He is looking forward to December and I don’t have the heart to tell him that November was just a warm up. Now the real fun starts in December. I’m not telling my husband either. I want/need to save money but mostly I’m doing this because my son has health issues and his food needs to be monitored. I can’t monitor if I don’t know what’s in the food. Also, this way I know exactly how many servings of fruit and veggies he is getting each day. When is the last time you saw your kid get a side of spinach or Kale at a restaurant? Lastly, I don’t buy soda for the kids (we will not discuss my own diet soda habit) so if we don’t go out, he doesn’t have it. If we go out and I say he can’t have soda he feels deprived. If we eat at home, it’s not an issue because he rarely has soda at home. So even though it’s 12/1, I made meatloaf for dinner tonight. I know what I’m having for dinner tomorrow and Friday nights. I will look at the sales and plan next week’s menus on Sat. I’m trying to use my crockpot twice a week and am going to do more freezer cooking. I’m also toying with using my bread machine more because I can mix white and wheat flour so the bread is healthier. So many ideas, so little time! I hope to reduce the number of times we go out in December even more. Dare I say twice the whole month? Can we do it? We’ll see. Thanks for a great challenge and getting me started in the right direction. Good luck with your December challenge! good job you guys! i didn’t take the challenge but you have inspired me to try to cut back on restaurant meals also – they are just too expensive!